756 pages | 176 Color Illus. How can political science help you understand the world you live in? Modern approaches to the study of politics analyze why Congress, the president, the courts, and other political actors do what they do. Learning to think critically about power, institutions, and rules helps citizens engage constructively in politics and the wider world around them and helps us systematically identify false claims, biases, and misconceptions. Analyzing American Democracy teaches students to think analytically by presenting current political science theories and research in answering the engaging, big questions facing American politics today. It serves as both an introduction to American politics and to the discipline of political science by reflecting the theoretical developments and empirical inquiry conducted by researchers. Every chapter highlights the most current research and discusses related public policy. It demonstrates for students how to think critically and analytically, bringing theoretical insight to contemporary American politics. 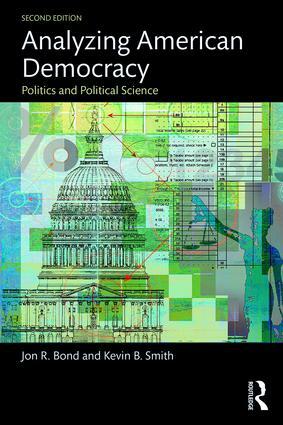 More than just a comprehensive overview and description of how American politics works, Jon Bond and Kevin Smith demonstrate how politics can be studied systematically. Throughout the text, they introduce students to the insights gleaned from rational choice, behavioral, and biological approaches to politics. Understanding these three social scientific models and their applications helps students get the most out of their American government course and out of this text--they learn a way of thinking that they can use to make sense of future challenges facing the American polity. Key Terms are bolded in the text, defined in the margins, recapped at the end of the chapter, and compiled in a glossary, all to help insure that students can effortlessly master the vocabulary of American politics and political science in order to move on to the more important concepts. The new edition of Bond and Smith’s revered text threads the needle by adding several exciting touches—most notably, the thoroughly updated content and thematically integrated boxes—without sacrificing the features that so many devoted instructors have long loved—most notably, the unapologetically scientific approach and the vivid, deeply engaging writing style. From its focus on the principles of democracy to the actual practice of democracy in the United States, Bond and Smith’s introductory text provides university students with the necessary tools to critically analyze American politics. The authors effectively apply political science research in a way that is fresh and accessible to students and do so in a way that will make students think well beyond their preconceptions about politics. The chapter on elections is the most thorough and engaging treatment of presidential elections you will find in an introductory American politics textbook. Jon Bond and Kevin Smith’s Analyzing American Democracy provides the most comprehensive and nuanced treatment of American political institutions and behavior to date. By drawing upon the most recent political science literature, the text encourages students to see American politics through a theoretical lens, and promotes a more generalized understanding of political concepts that transcend time and space. With stimulating real-world examples of the trade-offs, paradoxes, and competing ethical perspectives that are negotiated in a modern representative democracy, students become conversant and critically-engaged in the challenges confronting the country, and thus, become better citizens. Analyzing American Democracy is one of the best American Government books on the market. Not only is it comprehensive in covering material across the vast spectrum of American politics, but it also has an interesting point of view: the idea that our expectations of government and its performance may not be entirely realistic. Bond and Smith have written a book that is accessible to undergraduate students, yet provides sufficient detail for professors to examine the nuances of American politics today. Nobody does a better job than Bond and Smith of integrating modern political science with a thoroughly up-to-date introduction to American government. Most of my students have already been exposed to an AP-style high school American government survey, and a text that is clearly more science than civics is exactly what they need at the college level. On top of that the writing has the wit, snap, and drive that keeps students reading and thinking in spite of themselves. Teaching a broad survey course that covers the breadth of American politics can be a daunting task for both instructors and students. Bond and Smith have organized what could be an overwhelming amount of information into a logical structure coupled with a straightforward, journalistic writing style that incorporates cutting-edge political science research with key political concepts. The result is a textbook that is truly an introduction to political science, not just civics or popular politics. Jon R. Bond is Professor of Political Science at Texas A&M University. Kevin Smith is Professor of Political Science at the University of Nebraska-Lincoln.